I seem to be losing some steam here, as this week snuck up on me, and then I wound up doing something new that wasn’t that hard. Well, two new things. First, thanks to my friend Laurie, who unfortunately couldn’t make it, I wound up with tickets to see the author David Mitchell (Cloud Atlas) speak at Sixth and I Synagogue. I’ve been to book signings before, so that didn’t count, but it was the first time I have ever been inside a synagogue. (I’ve been to a number of Jewish weddings – but they were all outdoors). But as there was no service involved, I don’t think this should count. The Sixth and I Synagogue is beautiful, though, and David Mitchell was great fun. 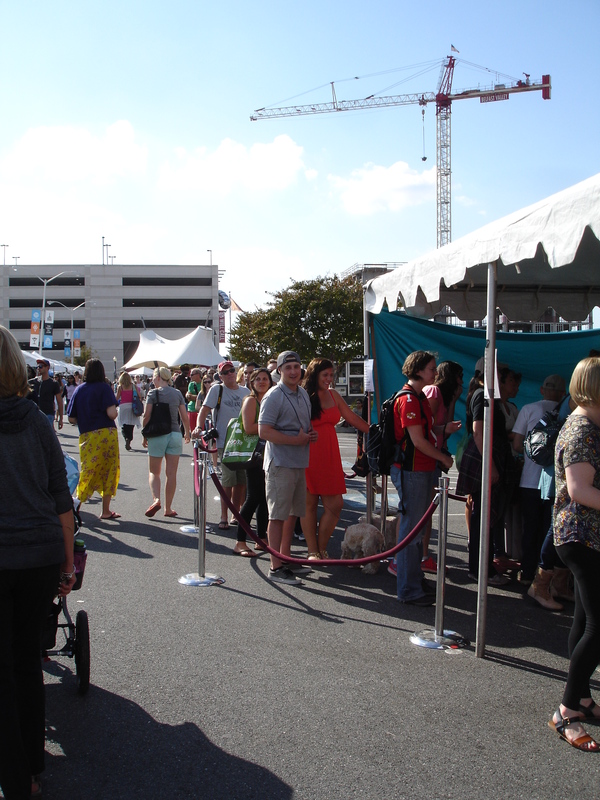 But this blog is about going to my first DC VegFest – you guessed it, a food festival for vegetarians. My New Year’s Resolution blog is supposed to get me out of my comfort zone, and here I was – out of time and ideas for the weekend – headed to a festival of comfort food among fellow vegetarians. Not really a stretch, but it technically was something new, and perhaps even adventuresome. So at this VegFest, I anticipated new restaurants and foods to try, as the Washington Post (WP) had put this as one of the top 7 things to do for the weekend. Also, as around 5% in DC are vegetarian/vegan (I need a more recent study), there are many vegetarian restaurants, and almost all restaurants in DC have vegetarian options (see a great WP article here about exploring this). a) only a few of the great standards were there: Woodlands Bistro’s food truck, Pete’s A Pizza, Sticky Fingers. I avoided them, as they are all in walking distance from my house anyway. No well-known/high-end restaurants were present that I saw except for the famous bakery Vegan Treats from Pennsylvania. b) the emphasis was on vegan, not vegetarian, which is admittedly trickier. c) most of the booths were not food related. Many were needed, such as those about hunger, animal welfare, etc…, but many were about vegan soaps, lotions, protein powders at $69 a bag, etc… Here is a great long list of participants. But I was there for the food. d) the lines at the places I wanted to try or heard were good were very long. The line for Vegan Treats goes way back there. I did try some cool new things like cultured cashew nut “cheese” (forgot who that was). But about half of the food I tasted was not my ‘flavor.’ And I’m sorry, but how many $10 per bottle kale-pineapple juice stands can there be? So I was rather disappointed in there not being more restaurants, especially some of the higher end or more mainstream ones in DC. But I ran out of stomach space and couldn’t try a number of stands, so maybe I’m not giving the festival a fare shake. In the end – it was still a new adventure. A new festival with new foods, definitely. It was great seeing the thousands of people there, as being meat-free is a good thing. (I won’t go into why here, as there are so many reasons.) I am grateful there is such a thing as a Veg Fest! Have a good evening – and a good meal.